A mission statement is not something you write overnight. It takes deep introspection, careful analysis, thoughtful expression, and often many rewrites to produce it in final form. It may take you several weeks or even months before you feel really comfortable with it, before you feel it is a complete and concise expression of your innermost values and directions. Even then, you will want to review it regularly and make minor changes as the years bring additional insights or changing circumstances. But fundamentally, your mission statement becomes your constitution, the solid expression of your vision and values. It becomes the criterion by which you measure everything else in your life. Thus, everyone's task is as unique as is his specific opportunity to implement it. In seeking to give verbal expression to that uniqueness, we are again reminded of the fundamental importance of proactivity and of working within our sphere of influence. To seek some abstract meaning to our lives out in our sphere of concern is to abdicate our proactive responsibility, to place our own first creation in the hands of circumstance and other people. Our meaning comes from within. Again, in the words of Frankl, "Ultimately, man should not ask what the meaning of his life is, but rather must recognize that it is he who is asked. In a word, each man is questioned by life; and he can only answer to life by answering for his own life; to life he can only respond by being responsible." Personal responsibility, or proactivity, is fundamental to the first creation. Rule 1 says "You are the programmer." Rule 2, then, says, "Write the program." Until you accept the idea that you are responsible, that you are the programmer, you won't really invest in writing the program. As proactive people , we can begin to give expression to what we want to be and to do in our lives. We can write a personal mission statement, a personal constitution. Process is as important as the product. Writing or reviewing a mission statement changes you because it forces you to think through your priorities deeply, carefully, and to align your behavior with your beliefs. As you do, other people begin to sense that you're not being driven by everything that happens to you. You have a sense of mission about what you're trying to do and you are excitedabout it. Our self-awareness empowers us to examine our own thoughts. This is particularly helpful in creating a personal mission statement because the two unique human endowments that enable us to practice. Imagination and conscience are primarily functions of the right side of the brain. Understanding how to tap into that right brain capacity greatly increases our mission creation ability. A great deal of research has been conducted for decades on what has come to be called brain dominance theory. The findings basically indicated that each hemisphere of the brain -- left and right -- tends to specialize in and preside over different functions, process different kinds of information, and deal with different kinds of problems. Essentially, the left hemisphere is the more logical/verbal one and the right hemisphere the more intuitive, creative one. The left deals with words, the right with pictures; the left with parts and specifics, the right with wholes and the relationship between the parts. The left deals with analysis, which means to break apart; the right with synthesis, which means to put together. The left deals with sequential thinking; the right with simultaneous and holistic thinking. The left is time bound; the right is time free. Although people use both sides of the brain, one side or the other generally tends to be dominant in each individual. Of course, the ideal would be to cultivate and develop the ability to have good crossover between both sides of the brain so that a person could first sense what the situation called for and then use the appropriate tool to deal with it. But people tend to stay in the "comfort zone" of their dominant hemisphere and process every situation according to either a right- or left-brain preference. In the words of Abraham Maslow, "He that is good with a hammer tends to think everything is a nail." This is another factor that affects the "young lady/old lady" perception difference. Right-brain and left-brain people tend to look at things in different ways. We live in a primarily left-brain-dominant world, where words and measurement and logic are enthroned, and the more creative, intuitive, sensing, artistic aspect of our nature is often subordinated. Many of us find it more difficult to tap into our right-brain capacity. Admittedly this description is oversimplified and new studies will undoubtedly throw more light on brain functioning. But the point here is that we are capable of performing many different kinds of thought processes and we barely tap our potential. As we become aware of its different capacities, we can consciously use our minds to meet specific needs in more effective ways. If we use the brain dominance theory as a model, it becomes evident that the quality of our mission is significantly impacted by our ability to use our creative right brain. The more we are able to draw upon our right-brain capacity, the more fully we will be able to visualize, to synthesize, to transcend time and present circumstances, to project a holistic picture of what we want to do and to be in life. Sometimes we are knocked out of our left-brain environment and thought patterns and into the right brain by an unplanned experience. The death of a loved one, a severe illness, a financial setback, or extreme adversity can cause us to stand back, look at our lives, and ask ourselves some hard questions"What's really important? Why am I doing what I'm doing? But if you're proactive, you don't have to wait for circumstances or other people to create perspective-expanding experiences. You can consciously create your own. There are a number of ways to do this. Through the powers of your imagination, you can visualize your own funeral. Write your own eulogy. Actually write it out. Be specific. You can visualize your twenty-fifth and then your fiftieth wedding anniversary. Have your spouse visualize this with you. Try to capture the essence of the family relationship you want to have created through your day-by-day investment over a period of that many years. You can visualize your retirement from your present occupation. What contributions, what achievements will you want to have made in your field? What plans will you have after retirement? Will you enter a second career? Visualize in rich detail. Involve as many emotions and feelings as possible. Involve as many of the senses as you can. I have done similar visualization exercises with some of my university classes. Assume you only have this one semester to live, and that during this semester you are to stay in school as a good student. Visualize how you would spend your semester. Things are suddenly placed in a different perspective. Values quickly surface that before weren't even recognized. I have also asked students to live with that expanded perspective for a week and keep a diary of their experiences. The results are very revealing. They start writing to parents to tell them how much they love and appreciate them. They reconcile with a brother, a sister, a friend where the relationship has deteriorated. The dominant, central theme of their activities, the underlying principle, is love. The futility of bad-mouthing, bad thinking, put-downs, and accusation becomes very evident when they think in terms of having only a short time to live. Principles and values become more evident to everybody. There are a number of techniques using your imagination that can put you in touch with your values. But the net effect of every one I have ever used is the same. When people seriously undertake to identify what really matters most to them in their lives, what they really want to be and to do, they become very reverent. They start to think in larger terms than today and tomorrow. Personal leadership is not a singular experience. It doesn't begin and end with the writing of a personal mission statement. It is, rather, the ongoing process of keeping your vision and values before you and aligning your life to be congruent with those most important things. And in that effort, your powerful right-brain capacity can be a great help to you on a daily basis as you work to integrate your personal mission statement into your life. It's another application of "Begin with the End in Mind." So I might write something like this: "It is deeply satisfying (emotional) that I (personal) respond (present tense) with wisdom, love, firmness, and self-control (positive) when my children misbehave." Then I can visualize it. I can spend a few minutes each day and totally relax my mind and body. I can think about situations in which my children might misbehave. I can visualize them in rich detail. I can feel the texture of the chair I might be sitting on, the floor under my feet, the sweater I'm wearing. I can see the dress my daughter has on, the expression on her face. The more clearly and vividly I can imagine the detail, the more deeply I will experience it, the less I will see it as a spectator. Then I can see her do something very specific which normally makes my heart pound and my temper start to flare. But instead of seeing my normal response, I can see myself handle the situation with all the love, the power, the self-control I have captured in my affirmation. I can write the program, write the script, in harmony with my values, with my personal mission statement. And if I do this, day after day my behavior will change. Instead of living out of the scripts given to me by my own parents or by society or by genetics or my environment, I will be living out of the script I have written from my own self-selected value system. We would try to get him in a very relaxed state of mind through deep breathing and progressive muscle relaxation technique so that he became very quiet inside. Then I would help him visualize himself right in the heat of the toughest situations imaginable. He would imagine a big blitz coming at him fast. He had to read the blitz and respond. He would imagine giving audibles at the line after reading defenses. He would imagine quick reads with his first receiver, his second receiver, his third receiver. He would imagine options that he normally wouldn't do. At one point in his football career, he told me he was constantly getting uptight. As we talked, I realized that he was visualizing uptightness. So we worked on visualizing relaxation in the middle of the big pressure circumstance. We discovered that the nature of the visualization is very important. If you visualize the wrong thing, you'll produce the wrong thing. Dr. Charles Garfield has done extensive research on peak performers, both in athletics and in business. He became fascinated with peak performance in his work with the NASA program, watching the astronauts rehearse everything on earth again and again in a simulated environment before they went to space. Although he had a doctorate in mathematics, he decided to go back and get another Ph.D. in the field of psychology and study the characteristics of peak performers. One of the main things his research showed was that almost all of the world-class athletes and other peak performers are visualizers. They see it; they feel it; they experience it before they actually do it. You can do it in every area of your life. Before a performance, a sales presentation, a difficult confrontation, or the daily challenge of meeting a goal, see it clearly, vividly, relentlessly, over and over again. Create an internal "comfort zone." Then, when you get into the situation, it isn't foreign. It doesn't scare you. Your creative, visual right brain is one of your most important assets, both in creating your personal mission statement and in integrating it into your life. In effective personal leadership, visualization and affirmation techniques emerge naturally out of a foundation of well thought through purposes and principles that become the center of person's life. They are extremely powerful in rescripting and reprogramming, into writing deeply committed-to purposes and principles into one's heart and mind. I believe that central to all enduring religions in society are the same principles and practices clothed in different language -- meditation, prayer, covenants, ordinances, scripture study, empathy, compassion, and many different forms of the use of both conscience and imagination. But if these techniques become part of the personality ethic and are severed from a base of character and principles, they can be misused and abused in serving other centers, primarily the self center. Affirmation and visualization are forms of programming, and we must be certain that we do not submit ourselves to any programming that is not in harmony with our basic center or that comes from sources centered on money-making, self interest, or anything other than correct principles. The imagination can be used to achieve the fleeting success that comes when a person is focused on material gain or on "what's in it for me." But I believe the higher use of imagination is in harmony with the use of conscience to transcend self and create a life of contribution based on unique purpose and on the principles that govern interdependent reality. 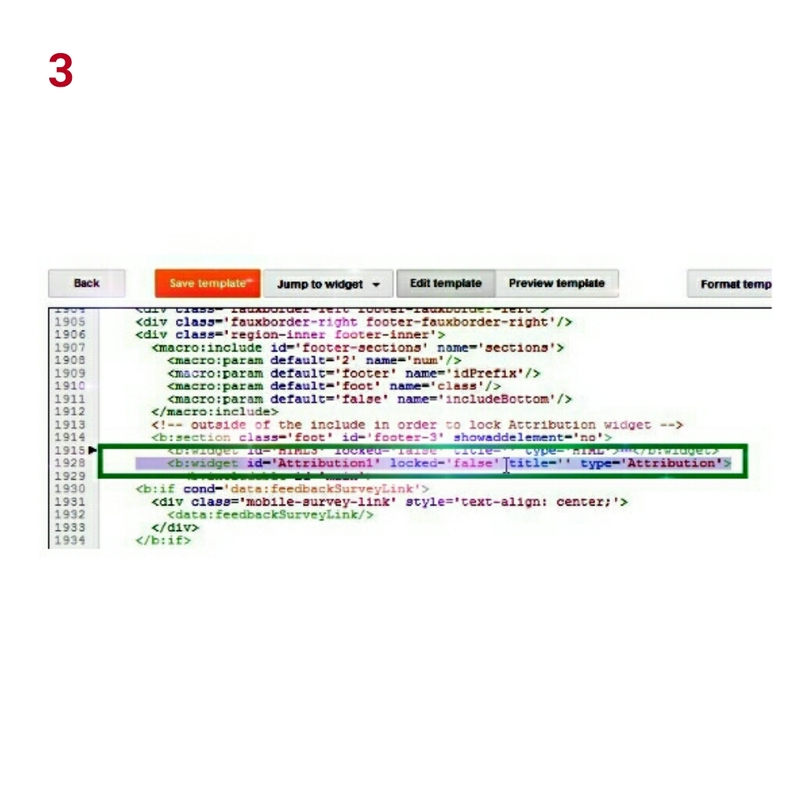 1.Locate theme and click on edit theme. 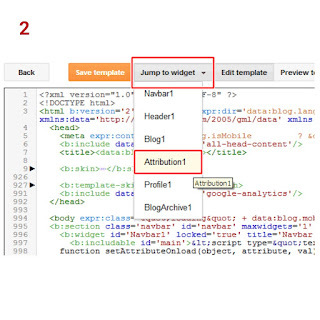 2.Press control F to search within theme for attribution or jump to widget attribution 1. 3.Then change the locked='true' with locked='false'. Click save theme. 4. Now, proceed to layout click on edit attribution. 5. 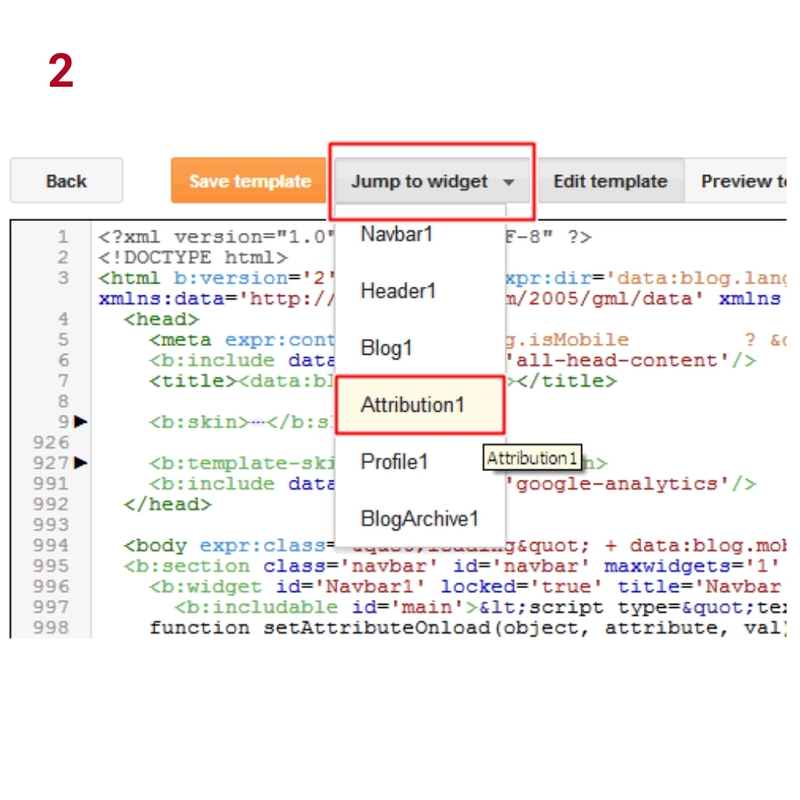 Select remove attribution and hit save. above #body. 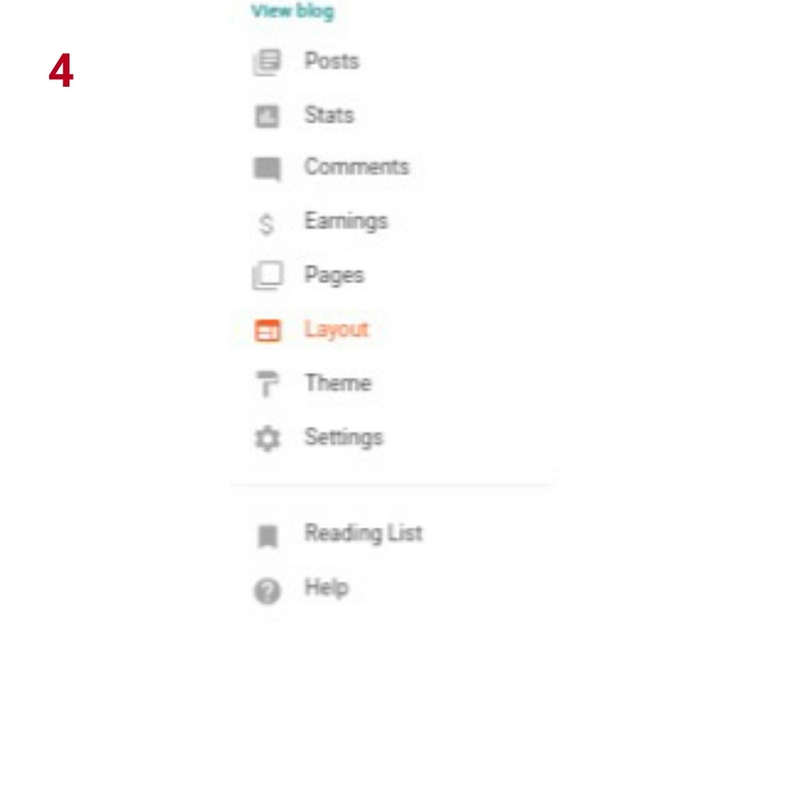 You can control F and search for #body on theme editor on blogger. Save theme and preview to see if it worked. Now you done. 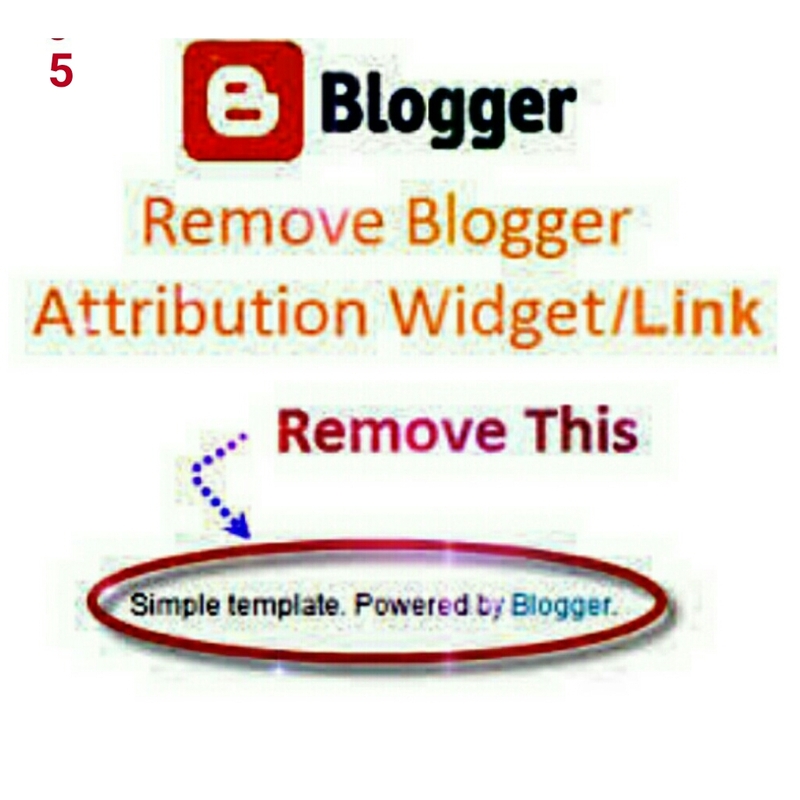 You have successfully removed power by blogger on your themes. Console applications are the kind of executables that you would use to create a command line utility. The command line utility could be dir or xcopy. Actually many ad-hoc C# projects are console applications. The C# source code shown in Figure 1 will calculate how many rabbits you get after a certain number of generations (assuming ideal circumstances, of course). 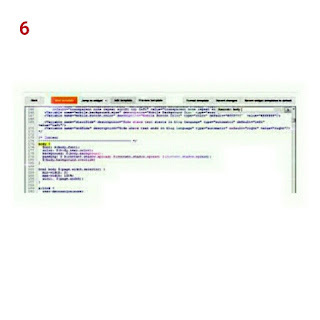 Figure 1 above is an example of a console application. If you build this application you can run it from the command line, and pass it an argument indicating the number of generations you would like to calculate. To build this file using the command line compiler you would use the following command. You will notice that it is not necessary to use the /Target switch like it was when we built the source code. This is because the default assembly built by the C# compiler is a console executable.This is how you build a console application; simple stuff! However, the Rabbits.cs sample also shows some interesting things about C# in general, so we will highlight them hereLike our last application, Rabbits.cs defines a class (arbitrarily named App) which defines an entry point function named Main(). The Main() method in Rabbits.cs does something a little different by taking a parameter defined as an array of String objects. These are the command line arguments passed to the program. Rabbits.cs uses structured exception handling to handle errors. 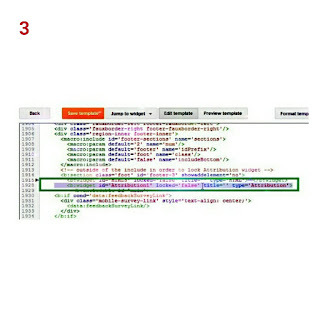 This is the try-catch code block that surrounds the bulk of the application. You will notice from this sample that C# uses C syntax for its loop constructs. 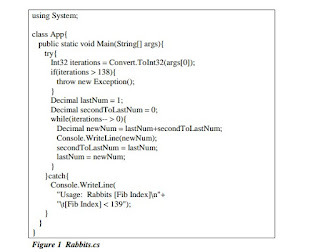 The while loop syntax in Rabbits.cs, is exactly what it would be in C, C++, or Java. The sample code in Figure 1 uses the static WriteLine() method of the Console type defined in the Framework Class Library to output text to the console window. Notice that an instance of the Console type was not necessary to call the method. This is because WriteLine() is defined as a static method. This sample uses a numeric type called Decimal which allows us to calculate many more generations than we would be able to do with a 32-bit integer value. The Decimal type is well suited for financial and scientific applications. Rabbits.cs is an iterative Fibonacci calculator. Its’ written this way just for fun. There is nothing about C# that would prohibit you from implementing this algorithm using recursion. 1. 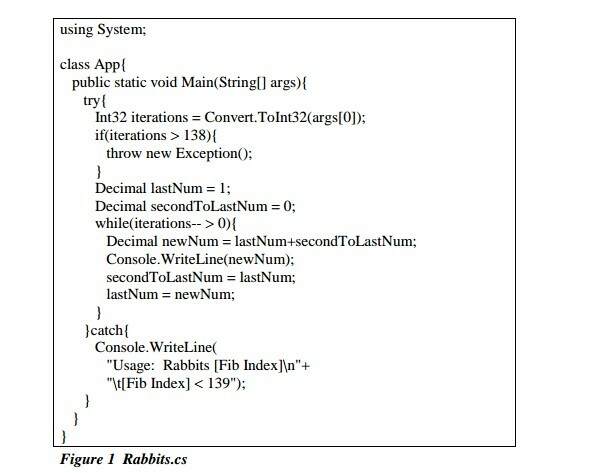 The source code in Figure 1 Rabbits.cs is a console Fibonacci number generator written in C#. 2. Type in or copy the source code and save it in a .cs file. 3. Compile the source code using the command line compiler. a. 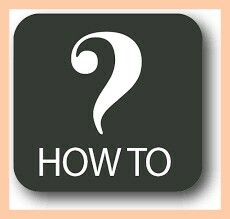 Hint: The line that you would use to compile this application is as follows. 4. Run the new executable. In this treatise, we learnt that Console applications are the kind of executables that you would use to create a command line utility. The command line utility could be dir or xcopy. We equally identified the steps required to build and run a console application. We have considered the concept of console application, the types of command line utility and a classic example of a console application. We equally identified the steps required to build and run a console application. Microsoft. September 4, 2003. "Visual C#.net Standard" (JPEG). Microsoft (June 18, 2009) C# Language Reference. 10.O' Reilly. (2002).C# Language Pocket Reference. ISBN 0-596-00429-X. Petzold, Charles (2002). Programming Microsoft Windows with C#. Microsoft Press. ISBN 0-7356-1370-2. Steinman, Justin (November 7, 2006). "Novell Answers Questions from the Community". Stallman, Richard (June 26, 2009). "Why free software shouldn't depend on Mono or C#". Simon, Raphael; Stapf, Emmanuel; Meyer, Bertrand (June 2002). "Full Eiffel on the .NET Framework". Archer, Tom (2001). Inside C#. Microsoft Press. ISBN 0-7356-1288-9. Cornelius, Barry (December 1, 2005). "Java 5 catches up with C#". University of Oxford Computing Services. Ecma International. June 2006.C# Language Specification (4th ed.). Guthrie, Scott (November 28, 2006). "What language was ASP.Net originally written in?" Hamilton, Naomi (October 1, 2008). "The A-Z of Programming Languages: C#". Computerworld. Horton, Anson (2006-09-11). 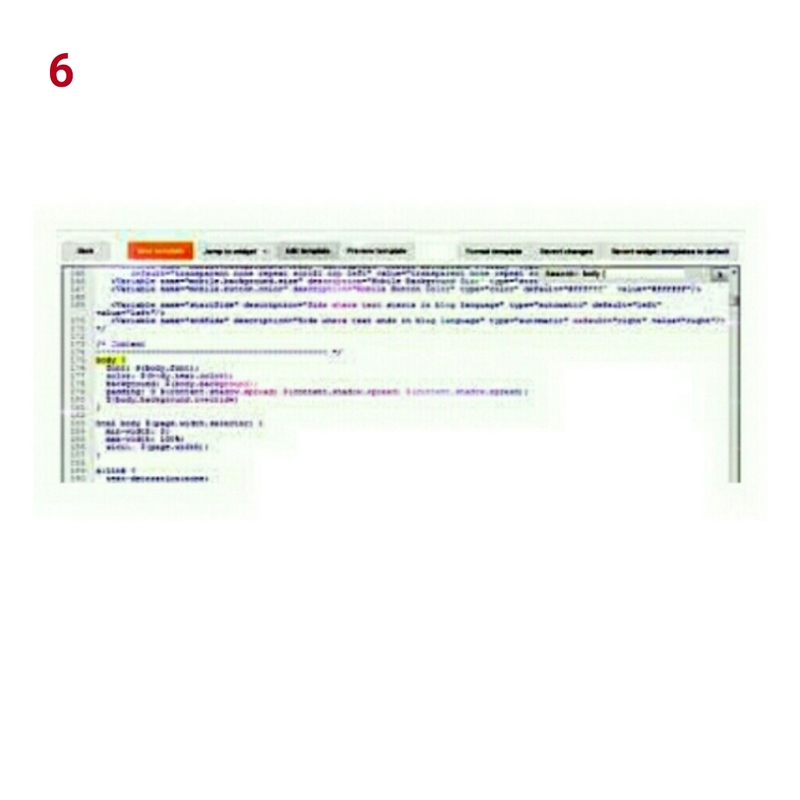 "C# XML documentation comments FAQ". Kovacs, James (September 07, 2007). "C#/.NET History Lesson". 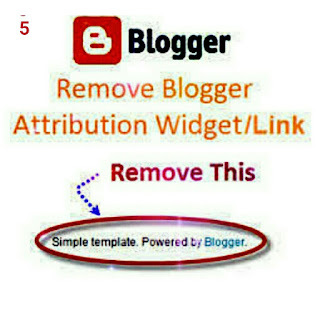 To own a blog on blogspot is very simple. 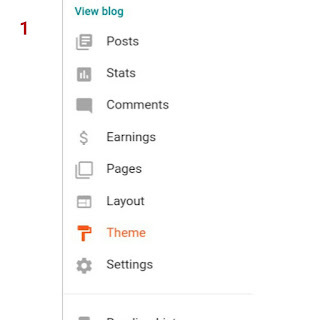 To begin with ,what is a blog? 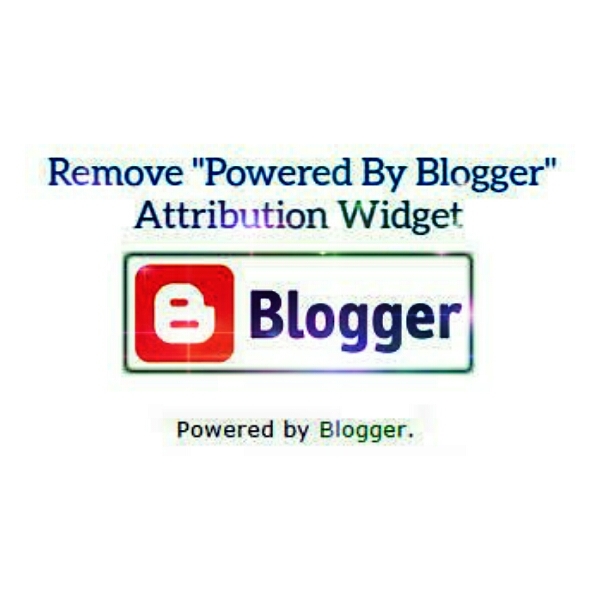 A blog is a blend of the term “Web log.” It is a type of Website or part of a Website. 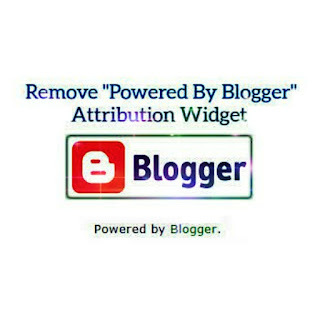 Many blogs provide commentary or news on a particular subject; others function as more personal online diaries. 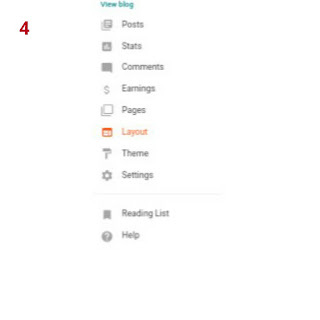 A typical blog combines text, images, and links to other blogs, Web pages, and other media related to its topic. The ability of readers to leave comments in an interactive format is an important part of many blogs. Most blogs are primarily textual, although some focus on art (art blog), photographs (photoblog), videos (video blogging), music (MP3 blog), and audio (podcasting). 2. After you have signed in or registered your [ Gmail ] account, go to Blogspot. 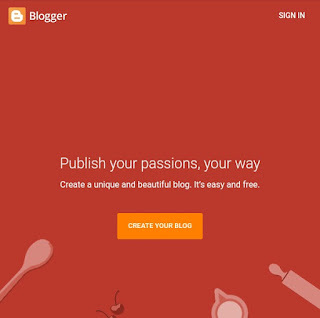 On the Blogspot homepage click on create your own blog. Now, your blog is ready. 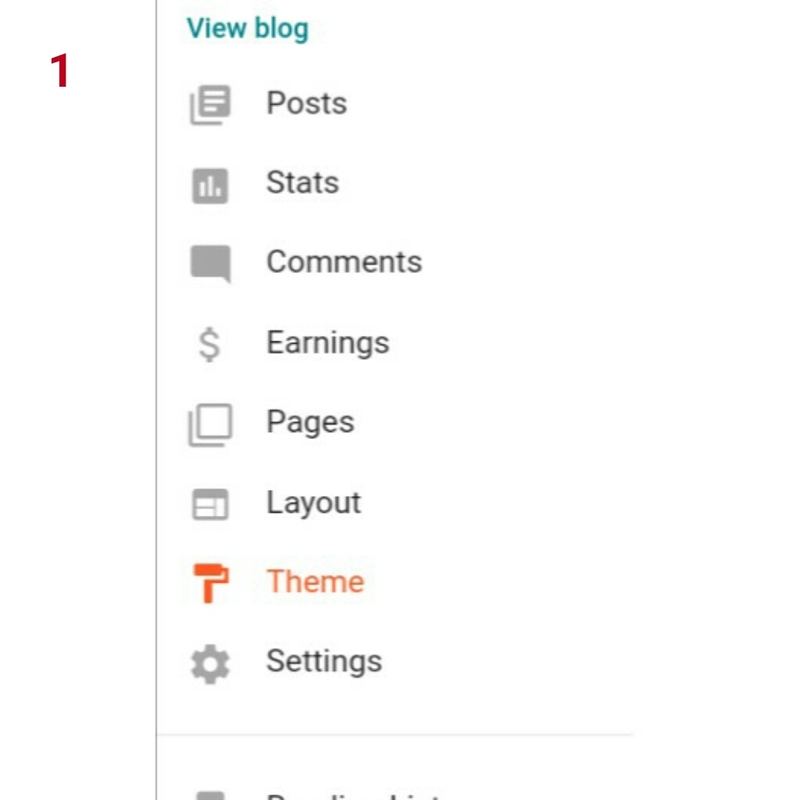 You can create your first post on New Post Menu after you have successfully created your account! 1.Give a shout-out to yourself :- Giving a shout-out to yourself probably the most influential thing that you can do for your own self, so shout-out to you for all that little and big accomplishments you made so far, it will enhance your inner confidence and you will be able to buckle yourself for further aims and goals. 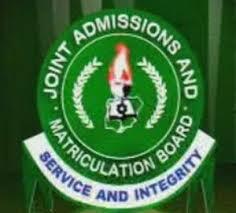 2.Polish your plus points and stand out-class :- Everyone knows his merits and demerits, by polishing your merits you can do wonders, so list up all your merits and from now on start working for refining them. By doing this you will see a noticeable change in you, you will feel confident and energetic because that will be the real you! 3.Best suit and tucker show :-Your appearance matters a lot, when you wear your desired raiment that you know is liked and will be liked by everyone will automatically add up a confidence in you. You feel and notice a great change in you. If you don’t believe it then just give it a try, take out your best suit and tucker and wear it. Take a walk to your mirror and meet a smart cookie standing right in front of your eye. In any gathering, either formal or informal when you become the part of it by your excellence appearance then before it gets noticed by anyone else you will be the first one who will notice that the way you will walk around will let you know how confident you are feeling. So, your appearance is one of the ingredient that garnish your personality by adding and enhancing confidence in you. 4. Display a grin at your face :- Smile is a beautiful gesture and when you pass a smile its not just you who looks beautiful rather your surroundings also seem amazing. People don’t like dead-pan faces, a face with a grin is loved by all. Smile leaves a ripple effect, it pleases others and this boost up your confidence that you are liked because you don’t wear a poker face. 5.Always lend a helping hand :- The person who lends a helping hand to others is the gentlest soul and he is the one who gathers so much well wishes and prayers from others because of his act of kindness. The love and appreciation from others boost up his inner pride and confidence. So, be that gentle soul who offers his kindness to others and make yourself proud. 6.Spend time with the things that please you :- Whenever you feel yourself doldrums and wants to recharge your self then all you need to do is to spend time with the things that please you, such as watch your favorite movie, make yourself a cup of coffee and read a nice novel, call your bestie and hangout with him. By doing this you will feel delighted, the moment you will please yourself will enable you to perform others tasks efficiently and confidently. Wish you success in all endeavors! <div class="camera_caption fadeFromBottom">A strong spirit puts you ahead of whatever the enemy throws at you. <em> You can do supernatural things, and you can make supernatural things happen by the power of God’s Spirit.</em> Grace is the solution to wrong behavior.